After two weeks of grieving her brother’s death, Carmen Whitted chuckled at the text-message thread that capped their final conversation. She grinned, iPhone in hand, at the image of Clayton Whitted and two of his fellow hotshot firefighters playfully perched in the branches of an “ancient, giant juniper tree” near Granite Mountain. The photo was taken in the aftermath of the Doce Fire, which ripped through the Prescott area one month before Clayton and some of his dearest friends died fighting a separate wildfire in the same region of northern Arizona. 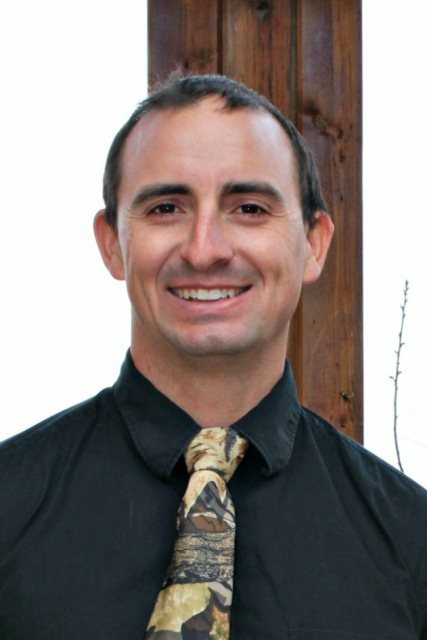 About one week later, on June 30, Clayton was among the 19 Granite Mountain Hotshots firefighters killed in the Yarnell Hill wildfire. He was 28 years old, a squad leader, and one of the older, wiser members of the crew. Carmen, 29, said the text-message reminded her about what her younger brother stood for and how he passed away serving as he felt God intended. Loved ones knew Clayton for his work ethic and boyish sense of humor, but perhaps mostly for his unwavering devotion to his faith. “As hard as it is, you can only be so somber for so long about it, especially knowing that he’s with God,” said Carmen, who works at GCU’s Peoria office on enrollment for the Ken Blanchard College of Business and College of Arts and Sciences. The past two weeks were agonizing and uplifting for the Whitteds and Clayton’s widow, Kristi, whom he married more than two years ago after they met through mutual friends at their church in Prescott. The Yarnell Hill Fire drew national media attention. A family friend volunteered to shoo persistent reporters away from Clayton’s home at one point. She and other relatives of the fallen firefighters met Vice President Joe Biden, former Homeland Security Secretary Janet Napolitano and other dignitaries at memorial services in Prescott, which helped them understand Clayton’s sacrifice defending his community. 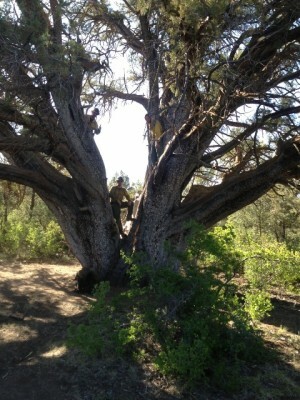 Clayton (far left) and two unidentified hotshots pose in a massive alligator juniper tree they helped save from the Prescott-area Doce Fire earlier this summer. The photo appeared in a final text-message to his sister. The families of the fallen firefighters have also coped with the ongoing investigation into the line of duty deaths. On Monday, the Arizona State Forestry Division released an initial synopsis report about the early stages of Yarnell Hill Fire. The report detailed how Clayton and the other firefighters faced 15- to 20-foot flames on the first day of the blaze as it “increased dramatically” in the dry landscape. Authorities are still looking in greater detail at possible causes for the firefighters’ deaths, though thunderstorms and unpredictable winds are suspected. In the report released Monday, fire officials indicated that some requests for additional air tanker support were “unable to be filled” as regional commanders allocated resources to active fires across the Southwest, though the report does not indicate how additional resources might have altered the fate of the firefighters. Carmen learned that her brother’s crew might be in grave danger on a Sunday evening as she played board games with her husband, Michael Alvey, and friends. Rather than relaxing in advance of the work week ahead, she found herself scrambling home to Prescott to be with her father, Carl, and other loved ones. Carmen’s enrollment manager, Luke Eyrise, said his team rallied support for Clayton’s family and helped raise money for gift cards to offset expenses during the difficult time. “There’s no good way to have that conversation with anybody, especially a friend,” Eyrise said. As the news unfolded, more Peoria office staffers wanted to assist. GCU has helped the Yarnell relief cause in other ways. Grand Canyon University Foundation donated $10,000 to the United Way of Yavapai County, which is assisting the families of fallen firefighters as well as residents who lost homes in the blaze. GCU employees have also contributed to the United Way and other non-profits focused on Yarnell. Enrollment counselor Tim Kane also has the goal of raising $25,000 for the 100 Club of Arizona, which assists families of fallen public safety personnel, after a 112-mile bike-and-run from Peoria to Prescott in honor of the Granite Mountain Hotshots. Jason Hiles, GCU’s new dean for the College of Theology, drove 20 hours to Phoenix from his home in Louisiana the weekend of the Yarnell Hill Fire. As he sorted through a new job and a brief separation from his own family, he was stunned by details of the families of fallen firefighters. Clayton’s faith stood out among those stories, which included profiles of expecting fathers and fathers of multiple children. Clayton carried a small Bible with him on hotshot assignments and was rarely without his Good Book, which included a list of people he meant to pray for daily. 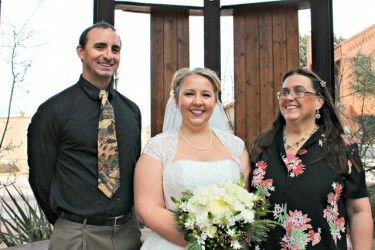 Carmen Whitted (center) is joined by Clayton and sister Cheryl at her December wedding in their hometown of Prescott. There is never a simple answer to questions about death, though Hiles said he was certain that death never has the “final say” for those who lead their families and communities in the spirit of Christ. Clayton began fighting wildland fires when he was 18. Loved ones believe he got hooked on firefighting after a middle-school brush with the law. He and a buddy had bought some smoke-bomb-type fireworks from a Prescott swap meet and accidentally triggered a small debris fire. The cops got involved. Clayton was ordered to attend a “fire class” where, Carmen suspects, he first learned about the impact of fire. Then he dedicated his life to firefighting. Carmen said Clayton took a brief sabbatical to be closer to their mother, Kathleen, as she went through a fatal bout with brain cancer. Carmen you are so loved and I wish I could have been there for you during this trying time. My thoughts and prayers will continue to be with you and your family. Please let us know what you need. What a blessing to know you will see him again in glory.